"Taylor recently photographed my boyfriend and I and we could not be more pleased! She is so kind, fun, and encouraging. I was nervous going into the shoot that I would feel a bit uncomfortable in front of the camera or unsure of how to pose, but Taylor made the time feel so natural. She let us be ourselves, but was always full of fun pose ideas when we ran out of our own. Taylor communicated clearly and promptly with us, returned beautiful, well-edited photos to us within two days, and made the process an incredibly enjoyable one. I could not be more pleased with Taylor White Photography or her work--we have already recommended our friends to her! 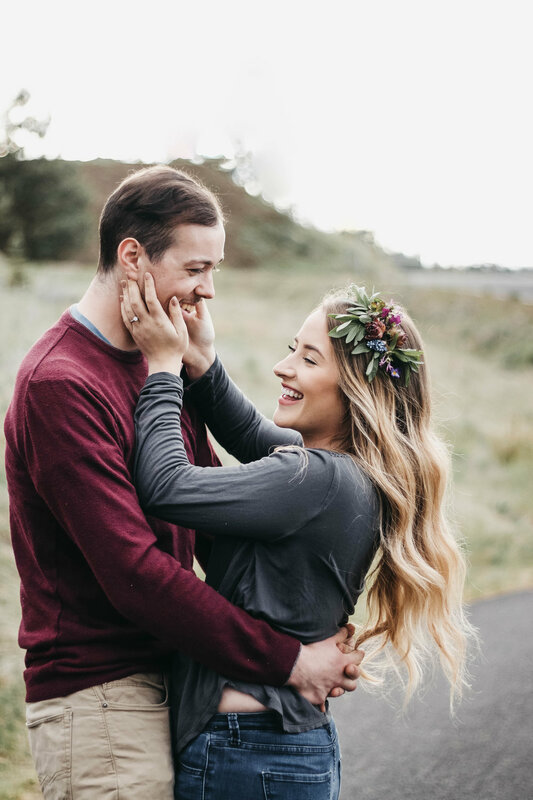 Thank you, Taylor, for beautiful pictures and a relaxed, fun photo shoot!" "Thank you so much for an amazing photoshoot. You are awesome and I am obsessed with all of the pictures that you took of my fiancé and I to say the least. I had a vision and you brought it to life, these photos are so special to us and we will cherish them forever. I appreciate how quickly you got all of the photos to me the morning after our shoot! Thank you for giving us beautiful pictures to look back on and remember when we are no longer living in Hawaii. I highly recommend Taylor for any photoshoot she’s great." "My husband and I had been living on Oahu for a few months and wanted someone to capture where we lived and walked to the beach every day. I found Taylor’s Instagram and loved her pictures! I emailed her and she responded RIGHT away. Her prices were right in our budget and she asked what kind of photos we were wanting (which I thought was very thoughtful). The whole entire photoshoot was so much fun with her and her fiancé (who came to assist her). They made us feel comfortable in front of the camera and captured our memories PERFECTLY! Some of my all time favorite pictures came from this photoshoot. I highly recommend using Taylor to take your pictures. They will turn out exactly how you envisioned them!" "I recently got my photos back from a shoot with Taylor, and I am BLOWN AWAY by her ability to capture such beautiful photos that really speak to who I am and remind me of my inner and outer beauty! I HIGHLY recommend Taylor for your photography needs! She knows how to create a comfortable and safe environment for natural and magical photos!! She listens to your concerns and works hard to bring out the best in you so that you have some truly special memories to look back on!" "I can't thank her enough for how well my photos turned out. 100% would recommend her to anyone and have my portraits taken by her again. I'm not too photogenic, but she made me look great and really captured my best angles. Taylor was very sweet, patient, and accommodating. She had great suggestions and understood what I wanted. She's an amazing photographer and I have so many pictures to choose from! It was a blast shooting with her. My pictures exceeded my expectations and I can't thank her enough!" "Taylor was amazing! The products that I received were top notch. I would totally recommend her to anyone looking for professional photos being taken. She listened to the wishes that I had and was very fun to work with. You definitely get more than what you pay for. I believe her work truly captured the essence of who I am and made me feel incredibly beautiful. I have gotten so many complements based on the photos that she took. The photos I received are everything I wished for and more. I am glad that I found Taylor and would recommend anyone to her. She does phenomenal work!" "This was the first time I ever did a photo shoot, and Taylor made us feel relax and really showed us how to have fun with it. Her work is amazing and the best part is you can sincerely tell that she is enjoying the Shoot just as much as you are! Thank you Taylor for capturing the emotions in the pictures we all wish to express." "I’ve known Taylor for quite some time and she is the absolute sweetest. She is so passionate about everything that she does and you can really see that through the photos that she takes. I love how Taylor really makes sure that her photoshoots are all about her clients and what they want out of it. She asked me what type of theme I like, then offered a few suggestions as to what she thought would best fit what I was looking for. She has such a good eye for lovely spots and always makes sure that you’re comfortable. When I was shooting with her, I didn’t feel awkward and I almost forgot there was a camera in front of my face! It’s so easy to just relax and have fun with her. I definitely recommend having Taylor take your photos! You won’t be disappointed! (She also sent me my entire gallery, edited and all, RIGHT after the shoot!)" "I’ve known Taylor for quite literally most of my life and she’s one of the most genuine and sweet individuals I know. She knew how to create a natural and comfortable environment for our photoshoot and was able to capture the small beautiful moments on camera. At the beginning of our photoshoot she encouraged us to try to act as if there wasn’t a camera in front of us. She did a great job at making us feel so relaxed in front of the camera that I almost forgot there was one at some points. Taylor also came prepared with many so suggestions that helped our pictures to come out amazing! I was so shocked when she sent back our gallery, edited and everything, the next day! I would highly recommend Taylor for any photoshoot."